Oversized sweaters have been the thing for so long that knitting much waist shaping feel awkward to me, now. And there is a lot of really interesting shaping going on in my Cherry Pie Cardigan. While I'm a little concerned about whether or not I'll be able to get my shaping to fit my shape well, I'm really loving the process. All the ways Teresa Gregorio has shaped the waist is intriguing. Plus, it's Twin Peaks-inspired, Guys! I've wrapped it around me and everything seems a-okay, except the ribbing is actually kind of snug. What?!? That's never happened before. I do subconsciously tighten up my gauge on ribbing because of years worth of loose, sloppy hems. But I think it'll block out. 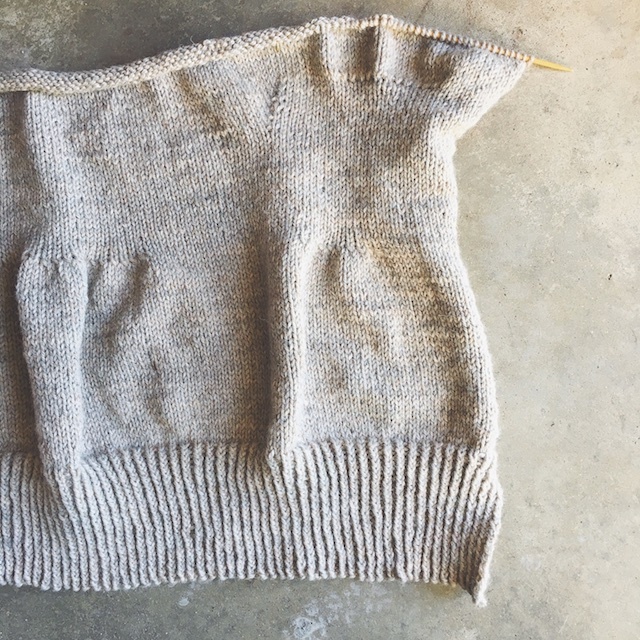 Usually, blocking is when floppy ribbing reveals itself. I'm a bit further than this photo. I've already begun my sleeves, two-at-a-time. I considered going up a needle size, after the sleeve ribbing, because my sleeves often come out in a tighter gauge than my sweater bodies. I changed my mind when I couldn't find a size 4 needle that was long enough for two-at-a-time sleeves. Instead, I'm trying a Zen knitting practice where I think "Loosen up. ", "Chill, man. ", and "Relax." and other such phrases said in a Beat Generation voice in my head so I won't subconsciously tighten my stitches. 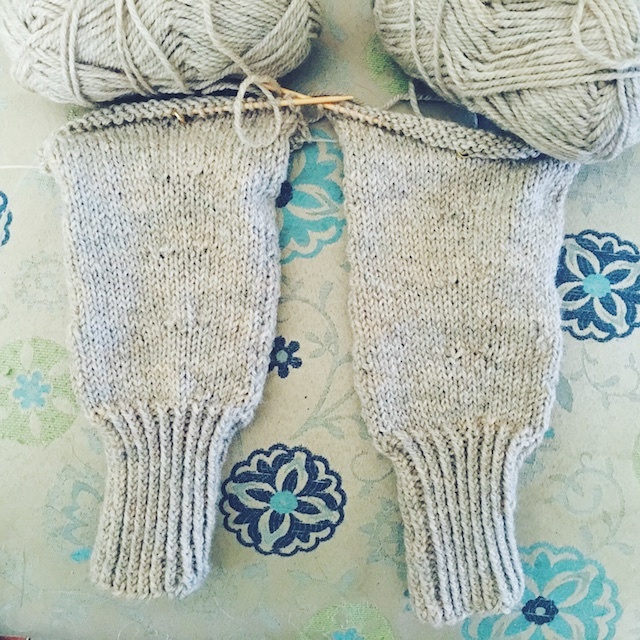 There are lots of works-in-progress in the Great Northern Knit-along group on Ravelry. This KAL includes a Cherry Pie thread, in which Kat's awesome skirt version of Cherry Pie has me thinking about matching skirts and sweaters (I'm laughing as I type that because it was so very hot this week that might look more like I'm undergoing some medieval penance to my neighbors. But, when has that ever stopped me?) and a thread for From Another Place. It's also a colorwork sweater but has a long or cropped length option. I want to knit one, a cropped version, maybe in a cotton blend yarn. Okay, I've got to quit distracting myself. On to sleeeeeeeeeves.